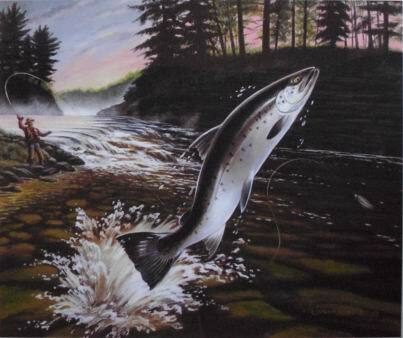 The Fish Creek Atlantic Salmon Club is offering limited edition prints of an original painting entitled, "A New Dawn - Atlantic Salmon in Fish Creek" by artist Milton Franson who has gracefully made it available to the club. Profits from the sale will be used by the club to support its activities in restoring Atlantic salmon to the Fish Creek watershed. Unmounted prints, measuring 12 inches by 14 1/2 inches and suitable for framing are $48.00. Framed prints will be available later. Prints are numbered and authenicated by the artist and will be limited to 750 copies. To order prints, fill in the order form provided and mail it along with a check made out to the club to the address indicated. To the artist, the painting is meant to symbolically portray the Club's efforts.
" I chose a young three year old fish, silvery bright from its recent travels from Oneida Lake to its birthplace on Fish Creek. The sunrise setting symbolizes the new dawn of hope for this fish species, here leaping free in its home waters, set against a dark background that symbolizes its emergence from 150 years of gloomy absense." In addition prints are on display and are for sale at local shops. A list of shops handling the prints follows. The Fish Creek Atlantic Salmon Club, inc is a Not For Profit organization.